Place cake in a blender and pulse until crumb consistency. Combine 2 tablespoons of blueberry juice and cream cheese and stir in the cake crumbs until dough forms. Form small balls and place in fridge to set. Place melted chocolate in a glass. Dip lollypop sticks into melted chocolate, adhere them into the cake balls. Place Cake Pops in Styrofoam then chill in refrigerator for 30 minutes. Mix powdered sugar with remaining blueberry juice. Place mixture in a piping bag or plastic freezer bag. Place sprinkles and pistachios into two small bowls. Remove Cake Pops from fridge and dip each one in melted chocolate. Allow them to drip, then place in Styrofoam block. Dip each of the Cake Pops in desired toppings and allow to dry. Cut a hole in the corner of freezer bag with blueberry icing and pipe icing to decorate lollypops. 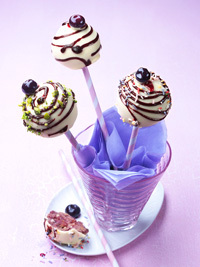 Garnish each Cake Pop with one blueberry and enjoy, or place in fridge until serving. Tip: If you don’t have a styrofoam block, you can use floral foam or drinking glasses.